Turbulence above and within canopies has characteristics distinct from that over rough surfaces. The vertical transport of momentum and scalars is dominated by coherent structures whose origin is now thought to be the result of the unstable inflexion in the profile of the mean wind speed established by the application of canopy drag. This distinctive property leads to the failure of the standard Monin–Obukhov flux–profile relationships over homogeneous canopies, relationships that are assumed in many surface exchange schemes within numerical weather prediction and general circulation models. A modification of the flux–profile relationships is presented that incorporates the effects of the canopy turbulence. 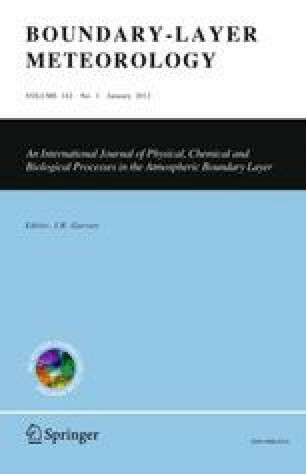 The subsequent impacts on the evolution of the surface energy balance and boundary-layer state are investigated within a simple numerical model for the evolution of the boundary layer and canopy state. By comparing cases with and without the modification it is shown that canopy-generated turbulence can lead, not only to the alteration of the flux–profile relationships above the canopy, but also to a different evolution of the surface energy balance and differences in near-surface conditions that would be significant in numerical weather prediction. More fundamentally, the modifications to the flux–profile relationships imply that parameters such as the roughness length and displacement height for canopies should not be considered as invariant properties, but rather as properties that depend on the flow and hence vary systematically with the diabatic stability of the boundary layer.